In this two-part series we’ll explore photographs taken from space. First, I had a chance to sit down with Astronaut Reid Wiseman. 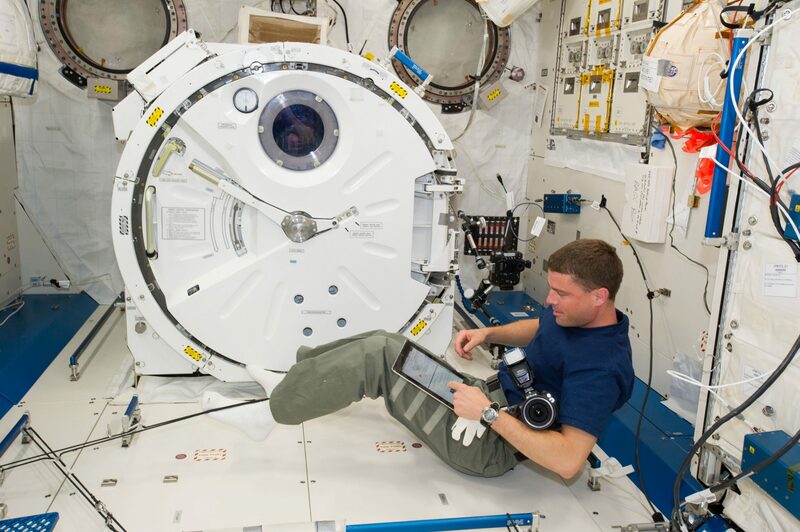 In this interview we learn how Photography is used on the International Space Station and a little about how Reid personally uses photography. The second article will explore the editing and science workflow that NASA uses to study the world with the photographs the astronauts take. You can listen to the entire audio interview with the link at the bottom of this article. Pamela: This is Pamela with Photo Focus and today we have an honored guest who is an astronaut. And I came across his work and I was quite impressed, we have Reid Wiseman with us. Hi Reid. Reid: Hey, Pamela, its good to be with you today. Pamela: I have been so giddy about talking to you today and getting some questions answered and dive into your work as an astronaut photographer and what you do up in space. So can you give us a little background of who you are and what you do first? Reid: Ok. So Ill try to keep it quick. I was born in Maryland and went to college up in New York at Rensselaer Polytechnic Institute, got a degree in engineering from that school. And then I actually joined the Navy for a while so for 12 years I was a pilot in the navy. I went through test pilot school where I picked up another Masters from Johns Hopkins and that was in systems engineering. And then I was lucky enough in 2009 to get hired as an astronaut, and then in 2014 I spent six months on the space station. So its been a pretty good journey. Pamela: Wow, did you have to do any special training to work with the photography equipment that you used? Reid: Absolutely. Most of our equipment, and I think maybe you’ll get into this later, but most of our equipment is Nikon D3, D4 now on the space station its all Nikon D4s. So we do a pretty basic training syllabus with instructors here at NASA, we have two instructors that know the cameras far better than I could ever know them. They sit down and kind of teach us Earth based photography and they also teach us a little bit of the differences of when youre in space and what you need to do with the cameras to get them working well. And then a lot of it though is on-the-job training and its really hard to practice on Earth to take a picture of the rim of the Earth with the black of space in the background and to do tricky things with the camera. So really on-the-job training is where its at. Pamela: What were the biggest challenges and differences from shooting on Earth versus shooting in space? Reid: Well in space youre always, this is going to sound silly but, youre always shooting through a window. And so if that window has any scratches on the inside, you know, any sorts of defects then for me I want to play with the aperture, open the aperture up as far as I can and hide those scratches when Im taking the pictures of the Earth. But then theres times that you can’t do that and so trying to find that whole balance is one thing. And then the other thing is the camera is reallyif youre in a programmed mode or youre set up automatically, the cameras not used to looking at half incredibly illuminated Earth picture and half complete blackness in space so it takes a little while. Basically I ended up just in manual mode, playing with my own kind of exposure, shutter speed, aperture and even ISO to get the pictures to look the way I wanted them to. Pamela: So a lot like on Earth its a trial and error with what you do [laughing]? Reid: Oh exactly. And now that film is free in the digital age I think we took somewhereme and my crew mates took somewhere between 300 and 400 thousand photos while we were in space, so you can certainly rest assured there was plenty of trial and error. Pamela: Now another question is, obviously youre in a zero gravity situation and youre probably doing some slower shutters, how are you stabilizing that camera? Reid: Well you know, everything is a tradeoff so in some ways one of my favorite lenses was the 800 millimeter, we had an image stabilized 800 millimeter lens and I would throw that on a D4 and on Earth that would take a pretty hefty tripod and a lot of effort to keep it stabilized, and in space its nothing, its just floating right at the window. So from that perspective it was awesome. The only thing I had was the mass of that lens so it was tough to move but it was very easy to hold. And then any timeso we just used a standard shutter roll so if I got an 800 millimeter on I want 1/800th of a second on my shutter or faster and then Im just going to hand hold it. If I have to go slower than that then we have what we call bogen arm, a regular manfrotto kind of arm that we would mount to a hand rail and then we would have a camera shoe on the bottom of that, we would attach that to the bottom of the camera. Its a great mount because the camera is weightless and so you just have to put a little bit of friction on the lock knob and it stays in the window real well. The only gotcha there though is youre going about 18,000 miles an hour so if youre doing a releasea long shutter picture then, you know, Earth blur is a big problem. But sometimes it adds to the picture but most times its unwanted blur. Pamela: I like the Earth blur as a problem [laughing]. Oh wow! Here in my head Im visualizing doing the trial and error of trying to get some of these shots, what are examples of a typical photograph that youre trying to do from space? Reid: So I think the most typical photo is the day time where you have about two thirds of your image is filled up by Earth and then one third is filled by the blackness of space, to me thats the most typical, you know, online type of photo that you see. And its a pretty easy photo to take. What I would do is that I would expose off of the brightest cloud in the Earth field in a manual mode. And then I would justwe always use Focus, Frame, Fire, and so I would expose focus on the cloud as well and then frame the shot and release the shutter, and thats the most basic. But then thats the easiest and then they get a lot harder from there so the next hardest is probably trying to use the 800 millimeter straight down to get a city shot of like my home town or something, and then you have to track the Earth as its going by and, if you don’t track itll be blurred, so youre tracking the Earth and shooting that one. And then the most complicated are probably night Aurora shots or any sort of trying to get night stars, its really hard to get those pictures from space. Pamela: What have you found works the best on getting those? Pamela: No pun intended at all [laughing]. Pamela: Do you shoot a lot of when youre on back to Earth? Reid: When you look at a picture on a picture or a nice big TV, you can tell what came from a really high quality camera or what came from your cell phone. And so Ive got two little girls and I take a lot of pictures of them playing and every weekend, every Saturday I try to get out the DSLR and take pictures of them with that, its just so much better. Pamela: Well, the best camera you have is the one on you [laughing]. Reid: That is a great point, that is a great point [laughing]. Reid: Are we talking photo gear or just in general gear? Pamela: Both, lets go for both. Reid: Let me just share one story from the copula on the space station is a 360 set of windows so you can see the whole horizon of the Earth, all the way around. And its really an amazing kind of observatory on the space station that we have up there. I flew with a German, Alex Gerst and hes a geophysicist, a volcanologist and we had to make a pact where we would each go to the copula once and not take a picture, and we were unable to do it. The Earth just providedday, night, it didn’t matter, provide so much beauty that we never got to the copula and didn’t take at least 10, 20 maybe even 50 pictures in a single shot. So I think on the space station your go to piece of hardware is your digital camera up there and we each keep one right in our bedroom up there. And then we have them just pre-staged all over the space station at any window, so anytime youre floating by a window if you see something cool you can just grab a camera and take that shot. Pamela: Oh wow! Thats pretty awesome and as far aseven on Earth, when youre with your camera is there a piece of gear like a tripod or something that you love to have on you as far as working with your photography? Pamela: Oh, not at all. Reid: That Im always putting on and taking off of my cameras, that polarized lens. Pamela: I have it everywhere I go [laughing]. Reid: Thats perfect, I need to start using that. Pamela: Lets see now, when youre up there how does the human element play into the images you take? We know theres automatic cameras that can take pictures, but when you put the human element into taking that picture, what sets that apart from the other automatic images that are happening? Reid: So I think thats a really interesting question because what I found at least throughI want to answer this maybe from the social media aspect. And what happens if Im looking down or my crew mates are at a phenomenon Earth and when you put that picture online, if you just put a picture online maybe a few people would look at it. But if you put a picture online with a couple of words it just changes the way people are captivated by that picture. And so this this blend of a picture is worth a thousand words but if you can just throw three or four words on as a caption for a picture, then it really draws the audience in a lot more than just that photo does. So if you take a picture of a hurricane and just put it online, a few people would look. But if you take a picture and say, Hey this is Typhoon Von Fong about to hit Taiwan, or something like that it really draws a whole different audience. Pamela: Absolutely, absolutely. What do you do with these images, what the purpose behind why these images are taken? Reid: In reality the purpose behind them its called Crew Earth Observations and we have a very small team of incredibly overworked people at NASA and they really look at every single picture that comes down from the space station and they catalogue it. And they will look at what is going on with humanity, deforestation and the Rainforest or sandstorms in Africa in the Sahara Desert. Or they really look at all of our night photography because the space station is one of the great places to get night photography. Theres not a whole lot of satellites up there that do that. And so they look at light pollution in cities and they can even check population control and is the city becoming denser into the center or is it expanding out like Houston, its just expanding across most of Texas these days. And they really look at these pictures and you can see a very good difference in just the 15 years the space stations been up there, you can see a difference in humanitys effect on the Earth. Pamela: Oh thats fascinating. Where can you see some of these images ourselves? Reid: Most astronauts are on Twitter, theres one main account. Its and those will pull up most of the pictures that weve taken. Or the individual astronauts that are up there themselves I am so all my pictures are under that name. Pamela: What is your favorite aspect about doing what you do up there? Reid: Well, our mission up there is science and so as a pilot I love pretending to be a scientist when Im on the space station and I love working with the people on the ground. Weve flown into space since 1960s and yet were still making crazy discoveries every day and theres always little things that people didn’t expect would happen up there. So from the professional side without a doubt thats the highlight its working with the guys on the ground. And just seeing that even though theyve researched this for their whole lives something different happens when you remove gravity from the situation. So that was really wild. And then the second though is to be a human being and to look out fromI think I was number 535 of people that have orbited the Earth so not a whole lot of folks have gotten to do it. And to look outside with some childish enthusiasm at our planet and to really understand that our planet is an incredible, living machine and were just a part of the journey, it really is fantastic. Pamela: Wow. Now, if you had a piece of advice for budding photographers, what would you give about something that youve learned about? Reid: I think the things that I learned the most so far is you got to read books. You have to read books by who have figured stuff out so thats the learning piece of it. And if you don’t understand aperture, shutter speed, ISO, the relationship between them and when you want to capture motion and when you don’t want to capture motion. Those are the basic things you need to do. And then you got to take a lot of photos with a lot of different lighting conditions and start to understandpick out your 10 favorite and try to figure out why theyre your 10 favorite. Was it composition? Was it lighting those sorts of things? In the digital age trial and error its free so just get out there and play around. Pamela: I think when I was learning the exposure triangle I listened to different lessons on it three or four times before finally the light bulb went off and once that light bulb went off it opened up a whole new world. Reid: For me it was reading a book called Understanding Exposure and it was super simple book, very well written and at the end of that book that light bulb was on for me and I really fell in love with photography right there, right at that point. Pamela: Oh I believe you. Now is there anything else that you would want us to know about your journey as a photographer and astronaut? Reid: Oh, just that it is a crazy ride and it was very worth it for me and, you know, theres thousands of people on the ground that made that journey possible. And thanks to all those folks, I was extremely lucky to be up there and get to look down on our planet from above. Reid: So heres a very quick storyI could tell you a thousand stories you probably don’t want to hear any of them. But were flyingI try to tell people this story, you know, occasionally youre mind changes when youre doing something. For you photography changed your mind a little bit and for me we did geology training here at NASA before I flew into space and I was standing on top of a mountain thats like 7,000 feet up in the US, kind of western half of the country. And the instructor said, Hey, look down, and I picked up this rock and there was a fossil in it. And it was it was a shrimp, Like how is it possible that thats up here at the top of the mountain? And he goes, Because this used to be on the bottom of the ocean. Reid: And it changed my mind. And so when were on the space station theres a day thats about two months in and were flying over Brazil, over South America and off on the Horizon it looked really dirty. Like, I wasman I was so disappointed I was like, Man, that is some seriously nasty pollution over Brazil. And we followed it and followed it and it just got worse and worse and worse as we went over the Atlantic Ocean. And it turned out it was a sandstorm in the Sahara Desert in Africa. Reid: It was blowing all the way across the Atlantic Ocean and landing in Brazil. And that changed my whole perspective on our world. It was like holy smokes, here is sand that is getting picked up in a desert on a different continent getting blown four or five thousand miles across the ocean and landing in Brazil. And it just changed my whole perspective on the Earth, its justthis place is amazing. Reid: So think about being a geologist on the ground in Brazil and youre finding this layer of sand, and maybe its a thousand years from now. And youre like, Man, where did this sand come from? You would never even think in your head that it can possibly be from Africa, but that is exactly where it came from. Pamela: I kept thinking how this was affecting the pollution in Salt Lake City. Pamela: And it directly was. So when youre describing all that wind and its justpeople don’t even know about stuff like that out in the world. Reid: But it is amazing theres so many powerful forces out there. Reid: Humans are also a very powerful force. Theres no part of this Earth that hasn’t been touched by our hands.